Select clip(s) in a bin and select one of Clip -> Place on Sequence at Start, Place on Sequence at Cursor, Place at Cursor on New Track, or Place on Sequence at end. 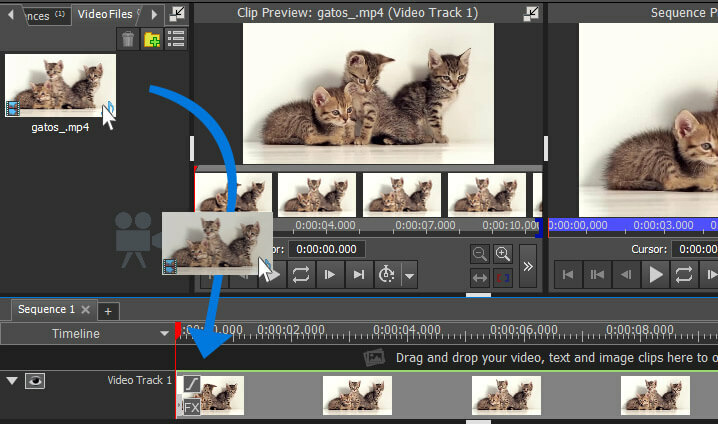 Select clip(s) in a bin and click the Place clip on sequence button (green down arrow icon), under the clip preview. Select the placement method (see below) from the Place Clip on Sequence dialog. Right-click on clip(s) in a bin and select Place on Sequence. Select the placement method (see below) from the Place Clip on Sequence dialog. Drag clip(s) from a bin and drop it / them on the sequence on the desired track and position. If multiple clips are placed on a sequence at the same time, the first clip will be placed at the selected position, and subsequent clips will be placed to its right. Clip(s) are placed on video or audio track 1, at position 0:00:00.0. Any clips already on those tracks are moved to the right by the duration of the clips being added. Clip(s) are placed on video or audio track 1, at the position of the playback cursor (the vertical red line). Any clips already on those tracks are moved to the right by the duration of the clips being added. Clip(s) are placed at the position of the playback cursor (the vertical red line), on the first track that has no clips at that point. Clip(s) are placed on video or audio track 1, after all other clips on those tracks. The sequence duration becomes longer. If the Place Clip on Sequence dialog's Always perform selected action. Do not ask me again. check-box is checked, the same method will be used when adding subsequent clips. This can be changed later using Options -> Media -> Add new clip to the following position.